Attention maritime history nerds: my new article on the historic relaunch of the Charles W. Morgan, America’s oldest commercial vessel still afloat, is posted at CoastalCommons.net. 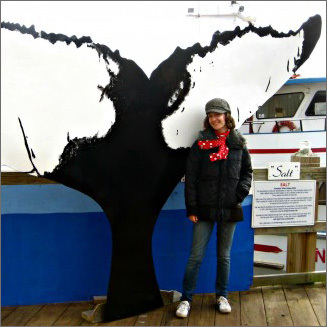 This story encompasses two spheres near to my heart, whaling history and environmental conservation, and proves that they aren’t mutually exclusive. Though I couldn’t attend the relaunch ceremony at Mystic Seaport in person, I did visit the Morgan when it was still in dry dock last year. Even under reconstruction, the old ship really gave me a clear picture of the living conditions aboard a 19th-century whaler. The Morgan sailed to the South Pacific and was fitted out with two giant try-pots for rendering sperm whale blubber into oil at sea. The hold was dark and hovel-like, with a beamed ceiling so low I could not help but imagine the headaches the crew must have endured. The small, uncomfortable bunks in the postage stamp-sized crew quarters gave me a view into hardship of months-log voyages. Now, the public will be able to see the Morgan afloat on its 38th voyage. Get the scoop here.